Our Quarterly Pest Management Program is designed to keep pests out of your home while being environmentally responsible. 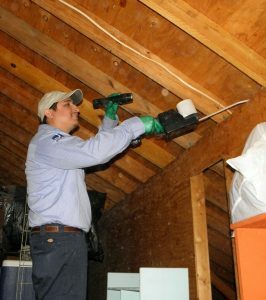 We believe that a quarterly program is best because the products we use have a limited residual life, because the seasons and life cycles of pests create new and emergent situations throughout the year and because the ever changing conditions at your home and property affect the likelihood of a pest infestation. It is vitally important that we have the opportunity to inspect and monitor, as well as treat your property regularly to achieve the best result. Our customer service specialist will schedule your appointment at your convenience for a specific time. Your uniformed Pest Management Professional (PMP) will arrive within 15 minutes* of that appointed time, greet you at the door with a smile, introduce himself and ask you about any pest issues you have been having. Your PMP will wear shoe covers to protect your home. After inspecting the interior of your home, he will bring any additional pest problems to your attention and explain what treatment is required. Future quarterly treatments will consist of an inspection for any evidence of pests, the same thorough exterior treatment, monitoring for pest activity and using pesticides on the inside only as needed. It is expected that you may see pests for up to two weeks after the initial treatment as bugs are flushed out of their hiding places. After that time, we will return free of charge if you see more than a few of any of the pests that are covered as long as you have maintained your Quarterly Pest Management Program agreement. 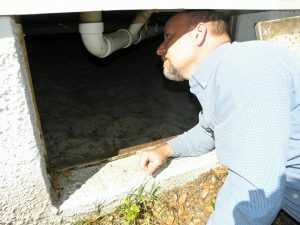 The Pest Force uses Integrated Pest Management (IPM) which is a strategy that focuses on long-term prevention of pest problems through a combination of techniques, using pesticides as needed. An important step towards success in IPM involves addressing areas conducive for pests and your PMP will bring these areas to your attention if they need to be corrected at your home. Attics, crawl spaces and garages are often perfectly suited for pests. These areas along with the interior and exterior of your home will be inspected and any areas that are inviting for pests will be brought to your attention. Much of what might need to be done to reduce pest infestation can be done by you. The Pest Force can offer an estimate to make corrections as well. The Pest Force offers discounts on additional services for those who are part of our quarterly integrated pest management program. If other pest issues are discovered that require a specialized treatment such as stored product pests, Fleas, German Roaches, wood destroying insects, Bed Bugs, flying insects, rodents, yard pests etc. The Pest Force has the solution and will give a reasonable quote to take care of that problem as well. For your convenience, your PMP is able to accept payment by cash, check, Visa or MasterCard. *It is our goal to reach every appointment promptly. If anything interferes with our arrival time, you will receive a call to let you know we have been delayed. The Pest Force services the following areas for Quarterly Pest Management: Myrtle Beach, North Myrtle Beach, Little River, Longs, Conway, Carolina Forest, Socastee, Surfside Beach, Garden City Beach, Murrells Inlet, Litchfield Beach, and Pawleys Island.